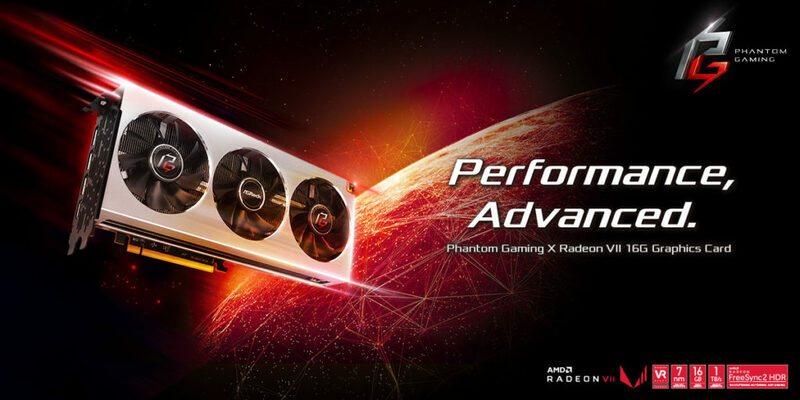 ASRock Launches Phantom Gaming X Radeon VII 16G Graphics Card Performance Advanced for Gaming and Creation by World’s First AMD 7nm Gaming GPU | Planet 3DNow! TAIPEI, Tai­wan, Febru­a­ry 7th, 2019 –The lea­ding glo­bal mother­board, gra­phics card and mini PC manu­fac­tu­rer, ASRock, laun­ches the flagship level pro­duct – Phan­tom Gaming X Rade­on VII 16G gra­phics card, fea­turing AMD’s world’s first 7nm Rade­on VII gaming GPU and 16GB 4096-bit HBM2 memo­ry with power­ful com­pu­ting per­for­mance, plus full inst­ruc­tion set sup­port such as Direc­tX® 12, OpenGL® 4.5 and Vul­kan® for the latest AAA-rated games, vir­tu­al rea­li­ty (VR), 3D ren­de­ring and video edi­t­ing app­li­ca­ti­ons, and next-genera­ti­on com­pu­ting workloads. It pro­vi­des a gre­at expe­ri­ence for enthu­si­ast gamers and pro­fes­sio­nal crea­tors. The Phan­tom Gaming X Rade­on VII 16G gra­phics card is equip­ped with the Rade­on VII gaming GPU built on the latest 7nm pro­cess tech­no­lo­gy based on the next-genera­ti­on Vega archi­tec­tu­re, achie­ving a base/boost fre­quen­cy of 1400/1750 MHz and with 16GB 4096-bit HBM2 memo­ry which is twice the capa­ci­ty of the pre­vious genera­ti­on Rade­on RX series, while the 1TB/s maxi­mum memo­ry band­width that is 2.1 times of the pre­vious genera­ti­on. The average game per­for­mance increa­sed by 29%, and the average con­tent crea­ti­on effi­ci­en­cy increa­sed by 36% com­pa­red with the pre­vious genera­ti­on Rade­on RX series. With the increa­sed archi­tec­tu­re and per­for­mance, cou­pled with the sup­port of Direc­tX® 12, OpenGL® 4.5, Vul­kan®, and the latest Rade­on Free­Sync™ 2 HDR tech­no­lo­gies, enthu­si­astic gamers can enjoy the seam­less, high-refresh HDR gaming expe­ri­en­ces at hig­hest reso­lu­ti­ons; crea­tors can also run the next-genera­ti­on pho­to and visu­al crea­ti­on app­li­ca­ti­ons on the 8K moni­tors. In addi­ti­on, the card uses a trip­le fan design to opti­mi­ze the heat dis­si­pa­ti­on, ensu­ring a long-time, sta­ble ope­ra­ti­on. It also has three Dis­play­Port 1.4 and one HDMI 2.0b ports to sup­port up to four dis­plays for mul­ti-moni­tor out­put that can deli­ver a grea­ter fle­xi­bi­li­ty in use for gamers and crea­tors. 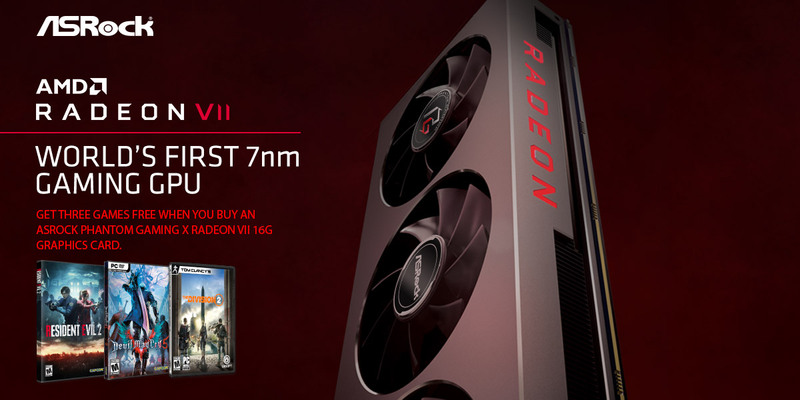 Over­all, ASRock Phan­tom Gaming X Rade­on VII 16G gra­phics card is equip­ped with AMD Rade­on VII – the world’s first 7nm gaming GPU, and 16GB lar­ge capa­ci­ty 4096 bit HBM2 memo­ry, to pro­vi­de a power­ful and com­pre­hen­si­ve per­for­mance for gamers and pro­fes­sio­nal crea­tors with the latest pro­cess and tech­no­lo­gies. The bund­led activi­ties of the three AAA games also bring a hig­her added value. 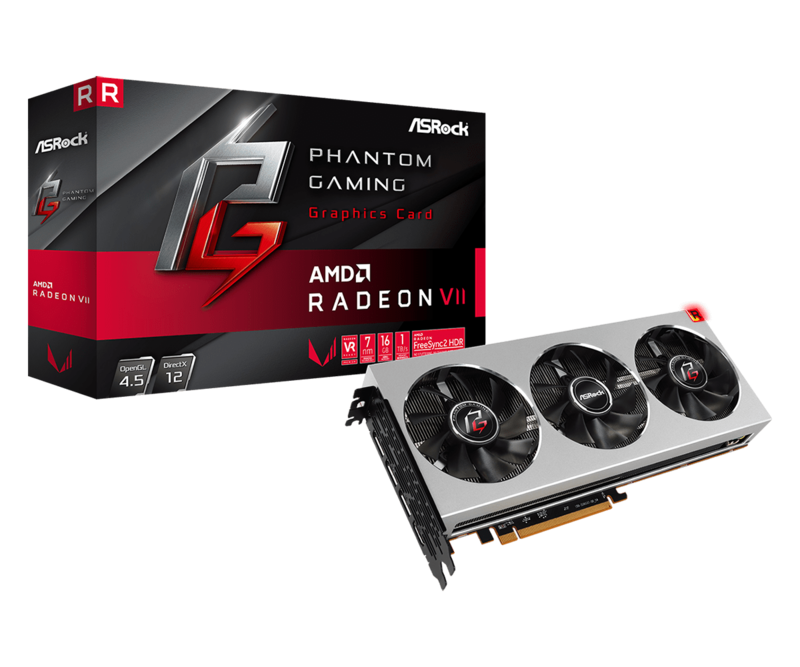 From this point of view, ASRock Phan­tom Gaming X Rade­on VII 16G gra­phics card is undoub­ted­ly an excel­lent choice in the cur­rent flagship gra­phics cards. *Spe­ci­fi­ca­ti­ons may vary wit­hout noti­ce.